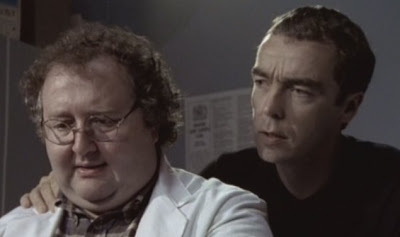 The late 1990s British mystery series McCallum deals with the forensic pathologist Dr. Ian McCallum (played by John Hannah) and his colorful co-workers. There's the recent Irish transplant Angela, the Hell's Angels wannabe Bobby Sykes, and a lab technician with the never explained moniker of Fuzzy Brightons. The story also covers McCallum's private life, which has plenty of ups and downs. The series starts with McCallum going through a rough patch in his marriage to the journalist Joanna. Eventually, the couple resumes their relationship, even though it seems as if the boyish looking Joanna is inexplicably a magnet for nearly every male she encounters. Before long, she disappears from the scene and McCallum reacts by going on promiscuous, drunken escapades. Even though his co-workers suffer for his actions, he never seems to be in any danger of losing his job. His co-workers have their fair share of problems too, ranging from alcoholism to driving offenses to crumbling relationships. Of course, in the midst of all this personal turmoil, people continue to die and need autopsies. There is a mystery of sorts to be solved in every episode, and after McCallum and his buddies eventually stumble across the solution, each episode ends abruptly. There's very little resolution as to how the cases turn out -- we're only shown that McCallum has solved the case, so no further explanation is necessary. I was saddened to read that the actor who portrayed the amusingly named Fuzzy Brightons, James Saxon, died in 2003 of a heart attack. He certainly was a memorable and sympathetic character. I loved this show and remember it well. Sarah, I'm glad it brought back memories for you. I guess next on my radar will have to be "Rebus." It will be interesting to see John Hannah's Scottish accent on the mean streets of Edinburgh!